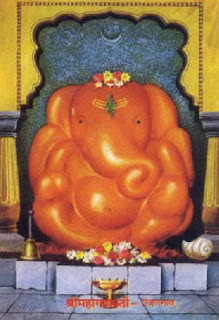 Shri Mahaganapati Temple in Ranjangaon, one of the 8 Ashtavinayak shrines, is located about 50 km from Pune, enroute to Aurangabad, in Maharashtra. Dedicated to Lord Ganesh, the temple enshires Maha Ganapati, the most powerful representation of Lord Ganesha – usually depicted as having eight, ten or twelve arms. Shri Mahaganapati Ashtavinayak Temple was built during the period of Peshwas. The stone pillars of the temple indicate that it was built during the 9th or 10th century. The temple faces east and has a magnificent main gate which is guarded by two statues of Jay and Vijay. It is designed in such a way that during Dakshinayan (the movement of the Sun to the south), the rays of the sun fall directly on the deity. The idol of Lord Ganesh is seated on a lotus, with his consorts Siddhi (Goddess of success) and Riddhi (Goddess of prosperity) on both sides. He is facing east in a crossed legged sitting posture, with broad forehead and the trunk turned towards the left. According to a mythology, a demon named Tripurasura built three powerful fortresses (the evil Tripuram forts); He obtained a boon from Lord Shiva that he could not be defeated by anything and using this, he caused suffering to all beings in the heavens and on earth. On hearing the pleas of Gods, Shiva interfered. But he realized that he could not defeat the demon. Finally, according to Narada Muni’s advice, Lord Shiva greeted Lord Ganesh, shot a single arrow that pierced through the citadels and defeated the demon. Hence Lord Ganesh is also known as Tripurarivade Mahaganpati. Lord Shiva, the demolisher of the Tripura citadels, is enshrined at Bhimashankaram nearby. Celebrations are held during Bhadrapada Shuddha Pratipada (the first day of the Bhadrapad month) to Shashthi (the sixth day). In the first four days the palanquin of Lord Ganesh is taken to different places in the village. It is called as Dwaryatra. For the first four days villagers are allowed to enter the sanctum and perform pooja on their own. On fifth day there is ‘Mahaprasad’ (big offering to Lord Maha Ganapati). Shri Mahaganapati Temple in Ranjangaon is open from 5:30 AM to 10:00 PM. The temple can be reached via Koregaon – Shikrapur – Ranjangaon, on Pune – Nagpur Highway. State transport buses ply from Pune. Rajangaon is 21 km before Shirur.